This is the final product. But to get to this point, Bruiser went through a 4 month transformation. Scroll down below to the links and follow along as Bruiser is stripped down and built back up. This is what Bruiser looked like before the transformation began. I acquired Bruiser from a good friend of mine in Colorado. Mechanically, Bruiser is pretty stout. It runs on front and rear Dana 44's, a Chevy 350 mated to a T-18 and twin-sticked low-geared Dana 300 T-case. As with all my projects, I like to sit down and figure out what I want it to be. For me, Bruiser was going to be my ultimate 3B. I planned on doing the project right so I would have no regrets later on. What I had in store for Bruiser was a complete frame-off build-up. I planned on stripping everything apart and rebuilding it on a 1971 CJ-5 frame. Bruisers old frame was pretty hacked up and bent. My first order of business was pulling out the full roll cage. With that out of the way, I was able to start breaking down the Willys. Click on the links below to follow along on the project. This is when Bruiser gets stripped down to the frame in preparation for a new frame. I clean and coat the new CJ-5 frame with POR-15 and bolt up the 4" lift. The Chevy 350 gets swapped into the rolling chassis. The under side of the tub gets cleaned and coated with POR-15. 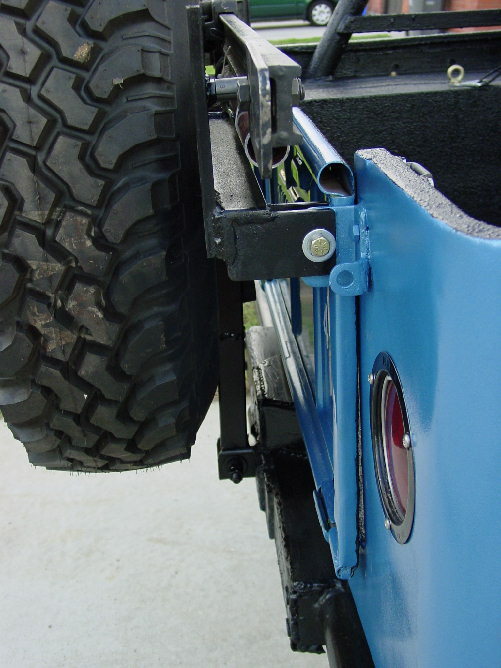 The CJ-5 frame gets some modifications at the rear. Welding up some holes in the dash. Adding a passenger side gas tank, dual gas tank solenoid, and switch. The interior of the tub gets a coat of Herculiner. I box the front frame rails, weld in an Advanced Adaptors steering box mount, and install Saginaw power steering. The front clip gets installed, and I weld in new front shock mounts. The clutch gets hooked up and I plumb the brake lines. Hydroboost braking power courtesy of the power steering pump. Bruiser gets some BF Goodrich 33/12.50 Mud T/A's. The passenger side tool box gets moved to the rear. I install an Optima red top battery and wire up the turn signals and headlights. Bruiser gets an aluminum racing radiator and electric fan. Bruiser is prepped for paint. 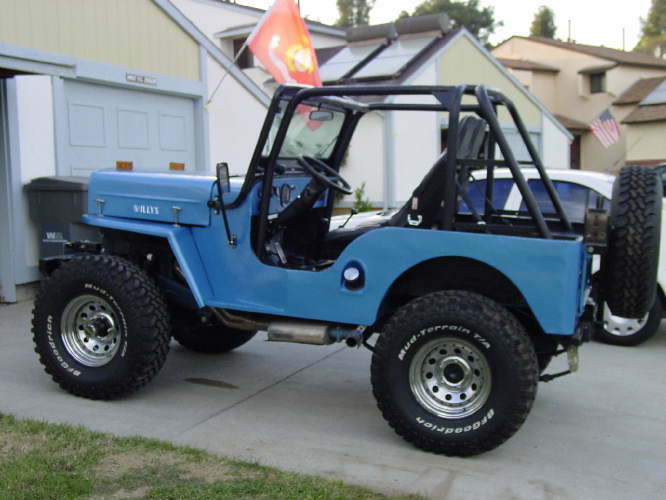 The original 1963 Willys color Nordic Blue Poly was chosen for Bruiser. Bruiser gets put back together. Installing the Willys and 4 Wheel Drive stickers, full roll cage, hood blocks, and other details. Adding the spare tire carrier and Hi-Lift jack mount. Wheel spacers from from Spidertrax. Bruiser gets a new Tigertop from Bestop. York A/C compressor based air system. Bruiser Gets Some Custom Fabricated Body Armor. Fabricating a diamondplate trunk lid NEW!